Junk, the price you’ll pay! Junk is something we all accumulate over the years and normally you can get rid of it at the local tip, however on some occasions the items or amount is too large, so what do you do? You can either hire a skip and do the manual work yourself or you can contact a company who will come and remove it for you. There is a saying ‘you get what you pay for’ and this also applies to junk, but like anything we don’t like paying out when we cannot see something for it at the end. 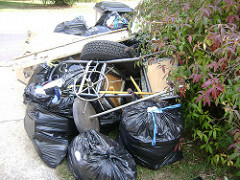 What does apply though is there is a law to disposing of your rubbish and this is that it has to be disposed of legally. Question. If you were to get your boiler fixed would you make sure the company was corgi registered or go with dodgy Dave who could save you that extra few quid but put your life at risk? Think we all know the answer to that one! We are all well aware of scammers, cowboys and fake products that are circulating in the market these days and this is highlighted on programmes such as Fake Britain, who make you aware of what to look out for so you don’t get conned. In rubbish removal anybody who clears junk/waste that has not been generated by themselves is in fact a business, who legally needs to have obtained a waste carriers licence from the environment agency. So you think to yourself I will google companies, make a few phone calls and see who is charging what. We get a lot of phone calls daily and on some occasions when we have quoted customers they have stated that someone is charging nearly ¾ less than the price we have. Impossible, as we know how much it is going to cost us to get rid of it, so I have pointed out to make sure they are a registered carrier of waste, to the reply “yes their number is on their website”. Alarm bells started ringing so I did a bit of digging. Again any one can make a website look amazing and you think you are getting the real deal but when I looked into a few, yes they are displaying a number but this is in fact a false one that is not recognised with the Environment Agency, so they are in fact collecting your waste illegally and who knows where it has ended up, probably up a dirt track or country road somewhere, so no wonder they were cheaper!! Don’t get caught out with the lowest price because if the rubbish can be traced back to you then be certain, you will be fined thousands. “cheapest is not always the best”. Just to be on the safe side double check the waste carriers number, which can easily be done by clicking here. It will give you the name of the company which should be the exact same one you have looked up or it will state 0 results, in this case give them a wide berth. If they have nothing to hide, then why isn’t their certificate displayed like ours?